It was San Francisco in the late 1990s. The tech sector was booming. Foundations and tech companies wanted to help their grantees and nonprofit clients operate more efficiently by making better use of technology. Funders hired “circuit riders” – more formally known as nonprofit technology assistance providers – to make the rounds among grantee organizations. Circuit riders did everything from setting up secure computer networks to creating databases and consulting with nonprofits on IT strategy. But no one event or organization existed for circuit riders to come together to share their expertise and experiences, resources and best practices. Enter…well, us. 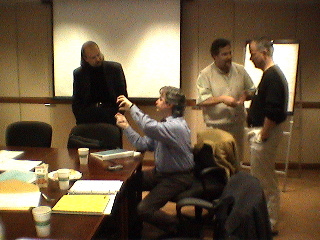 NTEN officially launched in 2000, the result of many, many conversations among the Mott, Packard and Surdna foundations, the nonprofit TechRocks, and AOL and IBM. At the start, NTEN’s focus was narrow: convening the circuit riders. Working with TechRocks, NTEN held its first conference, the Circuit Rider Roundup. The agenda included sessions on networking protocols, security, and databases with a sprinkling of web development. Those in attendance were self-described geeks and techies, and nearly everyone worked in funded circuit rider roles. In 2003, we changed the conference name from Circuit Rider Roundup to the Nonprofit Technology Conference (NTC) to reflect our increasingly diverse membership and technology’s pervasiveness – and potential – within the sector and individual organizations themselves. With the rise of email, “tech” spread into the realm of marketing and communications; with the growth of the web and online fundraising tools, it reached into development. The idea of circuit riders lost its relevancy as nonprofits hired their own staff to address their tech needs. In 2003, we changed the conference name from Circuit Rider Roundup to the Nonprofit Technology Conference (NTC) to reflect our increasingly diverse membership and technology’s pervasiveness – and potential – within the sector and individual organizations themselves. The NTEN community has continued to grow and lead the nonprofit tech field. In 2007 we introduced – and continually expand – our popular webinar programming. We’ve held dozens of local and regional events, led numerous research efforts and published IT staffing and spending and many other reports. The NTC, our signature event, broke a record in 2011 with more than 2,000 participants. Through ongoing events and communications, we continue to learn what community members need to make their jobs easier. And it doesn’t matter whether those jobs serve marketing, program, fundraising, IT or other functions: at this point, technology cuts across all aspects of nonprofit organizations. When we turned 10 in 2010, we did a lot more than just look back; we undertook a comprehensive strategic planning process to ensure a strong future. The process underscored the interdisciplinary and collaborative nature of our work. We’re energized and excited to further explore the ways we can work with others and create new opportunities for impact. Our capacity has grown, too, which means you can expect to see even more online and in-person programming. If you’re already an NTEN member, stay tuned. If you’re new to NTEN, we certainly hope you’ll check out the community and events that can help you bring about the change you want to see in the world. And, if you have a moment Beth Kanter found and preserved this footage put together by Sean O’Brien from the first circuit rider’s meeting. Now that’s some NTEN history. Beth has collected more circuit rider history on a wiki.